Be sure to check out the video below. Everyone loves to jump up and down and it starts as a kid jumping on the bed or furniture so it’s no surprise why jumping on a trampoline is so much fun because you can jump really high. All carnival rides need to be inspected by the state of Colorado as required by law. 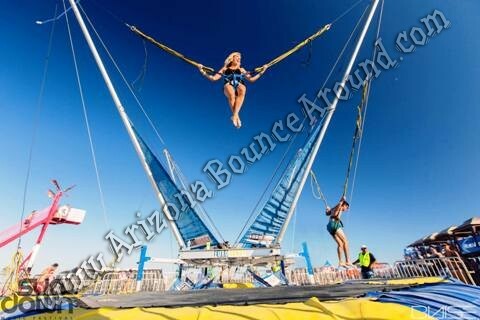 Our Bungee Trampolines are state inspected and ready for your next bungee jumping event. Not all bungee trampoline rental companies comply with this law so be sure to ask if the bungee trampoline rental company has a current Colorado inspection. Not all bungee trampolines work the same so be sure to look for Euro Bungee Trampolines. 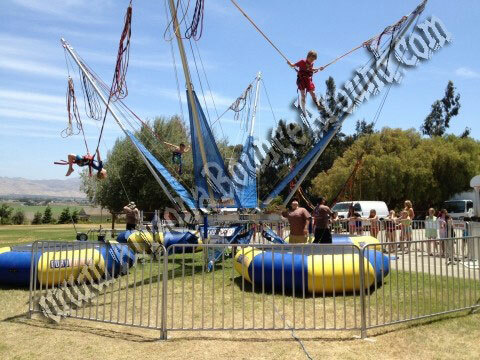 We only rent Euro Bungee Trampolines with inflatable trampolines and not the metal framed trampolines. Euro Bungee is the leader in high-performance bungee jumping and we provide different size harnesses for the jumpers so don't be fooled by cheap bungee trampolines that are much smaller and won't perform as well. When you rent from Gravity Play Events you can rest assured that only a high-performance Euro Bungee Trampoline will be delivered to your event complete with 2 staff members to operate it. Bungee trampolines take this to a new level propelling the jumpers some 30 feet in the air off the trampoline while being controlled by the bungee cords and the operator. The only requirement is the bungee jumper weighs between 40-200 pounds and or the harness fits the person correctly. 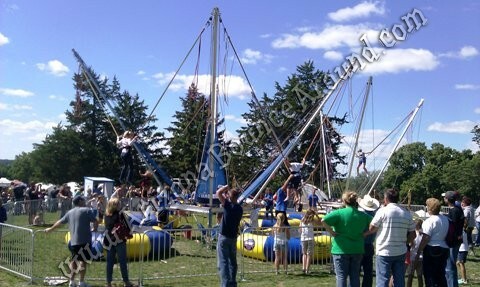 Bungee trampolines are the perfect event rental idea for carnivals, company parties, or fairs. 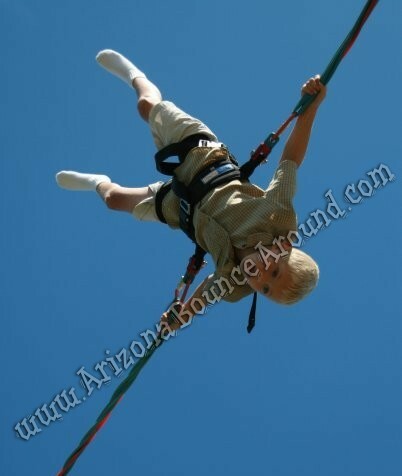 Our bungee trampoline price includes staff to operate, set up and removal. Some events may need or require temporary fencing for crowd control and this is not included in the rental price. Our bungee trampolines also require electrical supply so please call for details. We also rent carnival rides and a rock wall bungee trampoline combo. 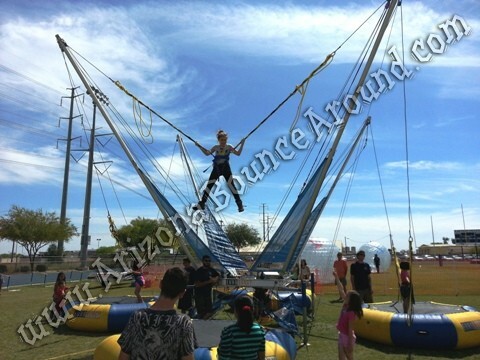 Euro bungee trampolines can be used at many different types of events from schools to street festivals. They are great at holiday time for malls, pumpkin patches, sporting events, races and many other places. 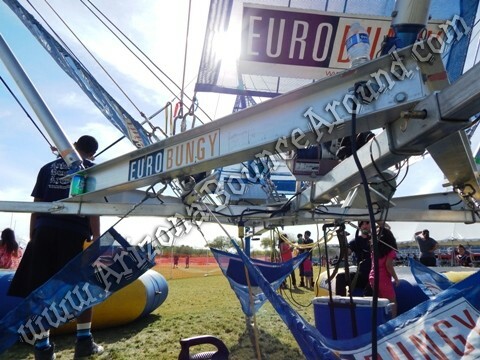 Euro bungee jumping trampolines will draw a big crowd and give your guests an exciting adventure. Promoting your event with activities for kids and teens will be easy by using some of the photos and bungee trampoline videos available here.